"This is the most amazing product I have ever used. As you can see from our before picture, our fireplace had a disgusting stain around our new wood stove. When we bought our house it was such an eye sore. I tried cleaning with many products and none worked. We looked into re tiling the fireplace and it would have cost us thousands of dollars. As you can see from the after picture, the fireplace now looks amazing. I can hardly believe it is the same fireplace It went from an ugly duckling to a swan!! !It did take us 2 days. We put on the base coat the first day and the other coats on the next day. The directions including the DVD helped so much. 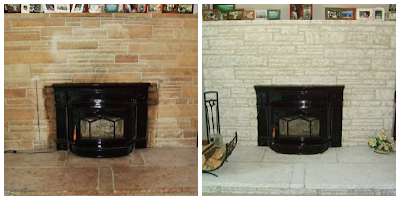 I would recommend it to anyone thinking of changing the appearance of their fireplace." This is the latest photo sent to me after I asked my readers to send in their brick fireplace transformation. Terri did an exceptional job and followed the instructions to the letter! I thing it is absolutely beautiful and am so pleased they liked the final results. Below I have listed the colors and the product that was used by Terri and I hope you will check it out today! Thanks friends.